Ethel Iona Phillips, age 79, of Holbrook, PA, passed away Monday, January 21, 2019 in her home with her family by her side. Born August 25, 1939 in Jackson Twp. PA, she is the daughter of the late Floyd Ray and Audrey (McMasters) Morris. Ethel was a resident of Jackson Twp. since 1988. She was a member of the Valley Chapel Church, Holbrook, PA. Ethel loved to work puzzle books and watch Animal Plant on T.V. 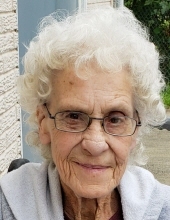 Ethel is survived by her six children, Debbie Phillips, of Jackson Twp., Bill Phillips, of Allegheny Twp., Donna (John) Carter, of Waynesburg, PA, Russell Phillips, of Holbrook, PA, Bonnie Phillips, of Waynesburg, PA, and Michelle Haught, of Jackson Twp. ; 24 grandchildren; several great-grandchildren; one great-great-grandson; one sister, Erma (Gary) Orndoff, of Waynesburg, PA. In addition to her parents, she was preceded in death by her husband, Frederick Earl Phillips, who passed away October 21, 2004; one son, Dennis Phillips; one granddaughter, Yvonne Phillips, in infancy; one grandson, Richard “Bub” Fuller; four brothers, Junior Morris, Floyd Pete Morris, Russell “Jake” Morris, and George Morris; two sisters, Velma Morris and Jessie Stohon. Friends may be received on Thursday, January 24, 2019 from 2-4 p.m. and 7-9 p.m. at Kesterson- Rush Funeral Home, LLC. 3275 W. Roy Furman Hwy. Rogersville, PA 15359. Telephone: 724-499-5181. A funeral service will be held on Friday, January 25, 2019 at 1:00 p.m. with Pastor Ben Williamson, officiating. Burial will follow at Valley Chapel Cemetery, Holbrook, PA.
To send flowers or a remembrance gift to the family of Ethel Iona Phillips, please visit our Tribute Store. "Email Address" would like to share the life celebration of Ethel Iona Phillips. Click on the "link" to go to share a favorite memory or leave a condolence message for the family.